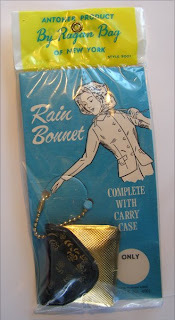 I remember plastic rain hats (rain bonnets) that came in little plastic containers and pouches like these. Mom would get one every time she went to the hair dresser (or beauty parlor as we used to call it). 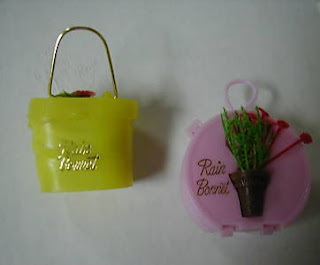 The plastic rain bonnet would get used and thrown away but my sister and I would keep the containers and pouches to play with. Posted by Karen at 7:33 p.m.
just found these at a rummage sale. I have a huge library and I have trinkets from my childhood tucked in every nook and cranny Most of the things you have listed....I have on my book shelf.